At least, that’s my interpretation of spring. But it won’t be that way here until late April or early May. Seriously, Mich. Spring, why you gotta always be so gloomy??? We are SO not friends right now. At the very least, can you please stop snowing? I don’t care if it’s only a dusting here and there – it’s still rude! I am admittedly one of those people who is affected by weather quality, specifically the availability of sunshine. Mostly gray, overcast days such as we’ve been having here in Detroit in droves lately are rough on my psyche. But that’s not really Mich. Spring’s fault, I know. She’s just being who she is. She’s not my fantasy of spring; she’ll never be D.C. Spring or Nashville Spring or Miami Spring – and all of us who live here would do best to accept that, to love and respect her and embrace her, just as she is (shout-out to rom-com classic, Bridget Jones’s Diary, and Mark Darcy loving Bridgie “just as she is.” Awwwww! Gets me every time.). 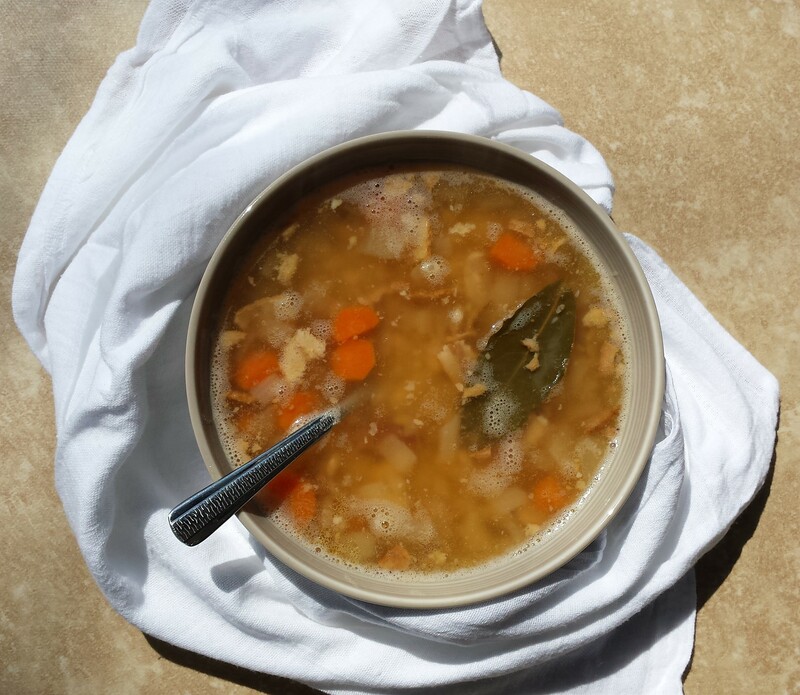 I hope you are able to love this white bean and bacon soup just as it is, too. It’s a humble, easy-to-prepare, simply rich and satisfying soup. I marvel over how such common ingredients can combine to form such complex deliciousness. It has to be the bacon – gloriously delicious bacon! – and all of the lovely flavorful grease that dripped off of mine when I baked it in the oven via a method of bacon-cooking that I gleaned from The Bible, a.k.a., The Kitchn (more about that method in the recipe below). And the garlic, of course. And the bay leaf adds a nice touch, too. OK, it’s hard to nail down exactly what makes this soup taste so good. What’s important is the fact that it’s at a taste level that’s sufficiently beyond just edible, if I do say so myself. It’s a bright spot in any day, but especially those gray days that are a teensy bit harder to love. My usual note regarding dried beans, which I used here: if you are also going to use them, you’ll need to plan ahead. Soak the beans, covered by several inches of water, in a bowl for at least eight hours. Then drain and rinse the beans, add them to a large pot of boiling water, reduce them to a gently rolling simmer, and let them cook for 60 to 90 minutes (60 minutes is fine, but they’ll be softer at 90). Then drain and rinse the beans again, and you’ll be good to go. 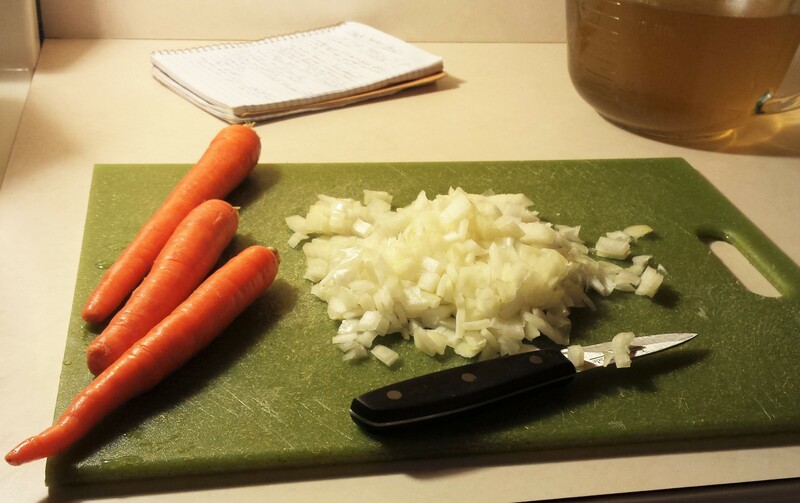 Also, for instructions on how to make your own homemade vegetable stock (another one of the ingredients) from saved vegetable scraps, see my recipe for spicy black bean soup; the method is outlined there. Preheat the oven to 400 degrees. Line a baking sheet with aluminum foil. Place the bacon strips on the sheet so they aren’t touching. 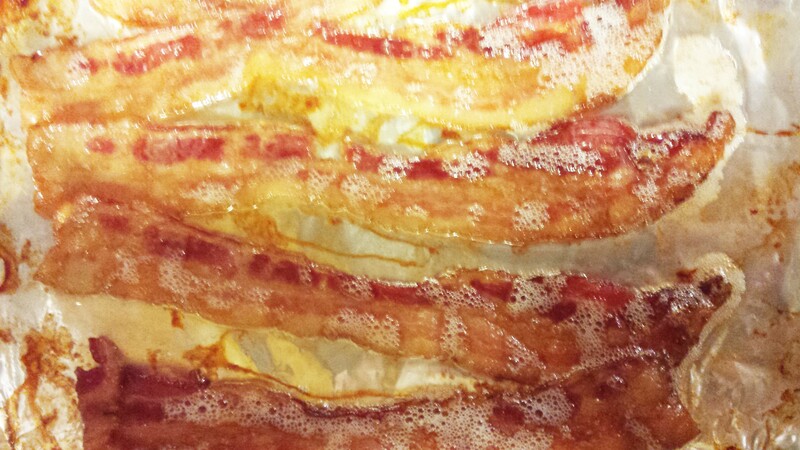 Bake until the bacon is cooked through and at least somewhat crispy – no rubbery bacon for our soup! The Kitchn, from which I gleaned this method, gives the cooking time as 15 to 20 minutes; however, mine went for 30 minutes to attain a decent crispiness, so cooking time may vary (although my oven can be rather slow). Once ready, let cool and transfer to a plate lined with paper towels. 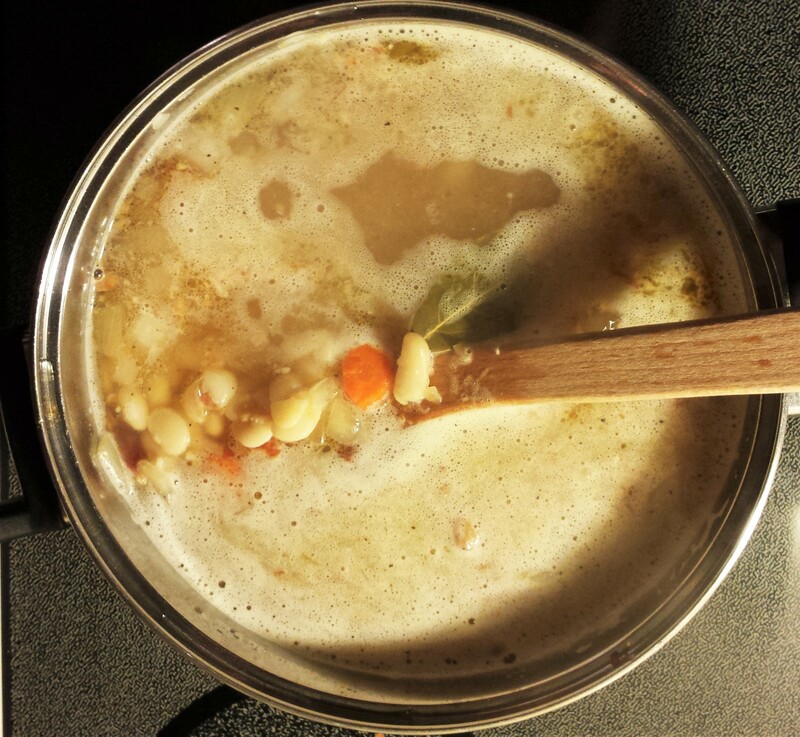 Don’t remove too much of that excess grease – it adds delicious flavor to the soup! To a large pot over medium heat, add the grapeseed oil, carrot, and onion and let cook until softened, about four minutes, stirring occasionally. Add the garlic and let cook for an additional two minutes. Then add the vegetable stock, beans and bay leaf; crumble in the bacon. Season with the salt and pepper, stir well to combine all ingredients, and bring to a boil. Once at a boil, reduce to a gently rolling simmer and let cook for 20 minutes. And that’s it! Makes about eight hearty servings.